Ford earns $20.2 billion, second biggest profit in company history, due to accounting gain, but quarterly operating results fall short of year-earlier results and forecasts. NEW YORK (CNNMoney) -- Ford reported its best annual earnings since 1998 on Friday, making 2011 the second most profitable year in the company's 109-year history. But much of the profit was attributed to a non-cash gain, as it put a large tax credit from past losses on its balance sheet that will shield it from taxes in the future. Excluding that credit, the automaker posted full-year and quarterly earnings that fell short of last year's profit as well as analysts' forecasts. Shares of Ford (F, Fortune 500) tumbled as much as 7.4% in early trading on the earnings miss before recouping about half the lost ground after assurances on an investors' call about earnings guidance moving forward. Shares were down 3.1% in midday trading. The company's 2011 net income of $20.2 billion, up from $6.6 billion in 2010, was the best since 1998, when it received a large one-time gain from the sale of The Associates financial unit. About $12.4 billion of the latest profit came from the accounting gain. Excluding special items, Ford reported operating income of $6.1 billion, or $1.51 a share, down from the $7.6 billion, or $1.91 a share, it earned on that basis in 2010. Fourth-quarter operating earnings of $787 million, or 20 cents a share, were down from $1.2 billion, or 30 cents, a year earlier. Analysts surveyed by Thomson Reuters had forecast earnings of 25 cents a share. Pretax earnings for the quarter and full year improved in Ford's home North American market due to increases in both the pricing and the volume of vehicles sold. The company's profit margin in the region also improved. The strong North American results mean that the 41,600 members of the United Auto Workers union will be getting larger profit-sharing payments for 2011. Full-year payments to the factory workers will average $6,200, up from $5,000 in 2010. But the workers already received more than half of that money in December due to the new labor deal reached in the fall. The company announced earlier this month that its white-collar workers would get both bonus payments and merit raises for 2011, the first time in four years they've received both. Profit fell in Ford's South American unit and the quarterly loss increased in Europe. The Asia-Pacific region tipped from a fourth-quarter profit a year earlier to a loss this time due to the flooding, but the company had already warned of that loss. Revenue for the year reached $136.3 billion, up from $120.9 billion in 2010, as it sold 5.7 million cars and trucks worldwide, up 7% from its 2010 total. Ford Chief Financial Officer Lewis Booth said that the accounting gain was significant for the company because it was a sign that the company is back to making regular profits. It had stopped booking the tax credits back in 2006, despite ongoing losses at that time, because of doubts that Ford would once again be able to make the kind of profits that would allow it to use those credits. CEO Alan Mulally said he considered the results to be strong, and that Ford missed its profits targets in the quarter due to external factors outside of North America, such as the economic slowdown in Europe and flooding in Thailand that shut factories and affected its supply chain. He said the company expects Ford's overall pre-tax operating profit in 2012 to be roughly the same as last year, as better auto profits will be offset by lower earnings from its finance arm. 0:00 / 4:43 Ford CEO: Trucks are back! And he said the company is still well on track to hit the mid-decade target it set last year of significantly better profits and global sales of about 8 million vehicles, an increase of about 40% from 2011 levels. Van Conway, president of Michigan turnaround consultant Conway MacKenzie, said Ford's results for the year were good, not great, and management really can't be blamed for problems such as the downturn in Europe. "The old line used to be when the economy got a cold, Detroit got pneumonia," he said. "They're clearly position to weather a storm far better than they did before." Adam Jonas, analyst with Morgan Stanley, said some of the earnings miss was due to higher engineering and other costs associated with development of new vehicles. He said the outlook remains good for the company. "2012 may be shaping up to be a very good year for Ford," he wrote in a note Friday. 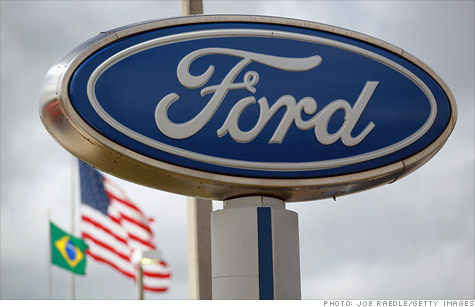 Ford is the first of the Big Three U.S. automakers to report results. General Motors (GM, Fortune 500) and Chrysler Group will report next month. But all are expected to post profits, the first time all will be in the black at the same time since 2004. All gained U.S. market share for the first time since 1988.